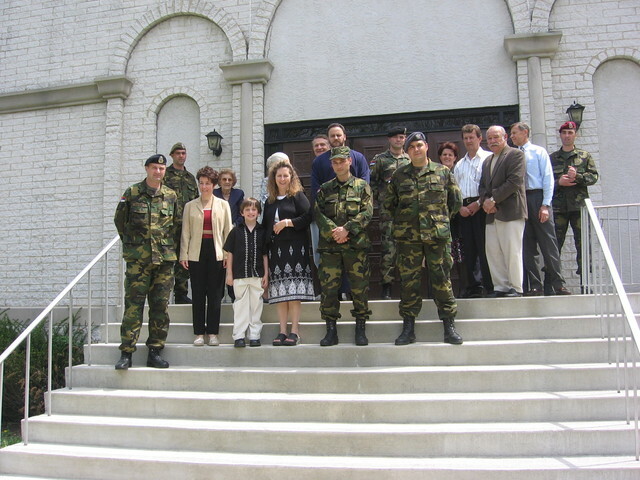 Columbus, OH - The most glorious and joyous day in the history of mankind – the day of the Resurrection of our Lord Jesus Christ, was for the parishioners of St. Stephen of Dechani in Columbus even more joyous with the presence of a group of soldiers from Serbia who attended their church. These soldiers are currently in Columbus, Ohio where they are taking part in the recently established program of cooperation between the Army of the Republic of Serbia and the Ohio National Guard, which is also the host of these Serbian soldiers. At the constant insistance of these soldiers to their authorities at the army base, they expressed their desire to go to the local Serbian Church on the occasion of the great feast of Pascha. Due to their resposibilities at the army base they were unable to be present at the Divine Liturgy but arrived as most of the parishioners had already left. Those few parishioners that were still at the church when the soldiers arrived engaged in joyous conversation with the soldiers, the main topic and interst being Kosovo and the need to endure in the rightoues and God pleasing defense of the Serbian Kosovo and Metohija, as well as the necessity for us a people to remain loyal to the Kosovo covenant. Tears of joy were at times mixed with those of sadness because of the injustices which have been dealt to the much suffering Serbian poeple by the mighty of this world. All of our hope is in the Resurrected Lord Jesus Christ for just as our Lord endured the worst possible sufferings, insults and even death, on the third day He resurrected in His glory. Our hope is that the Serbian people, after countless pains and persecutions, will await the final establishing of God's justice on earth, in spite of all opposing efforts of the powers of this world.